One might say, with apologies to Sinatra, that the Nettles have got the world on a string. Every time they move their fingers, life’s a wonderful thing. Taking that sentiment a step further, the Corvallis “Celtic fusion” band’s stringed instruments, along with the drums, pennywhistle and saxophone brought by turns into the mix, compellingly fuse a virtual world of musical influences for the group’s exuberant performances at pubs, weddings and contra dances throughout the region. Listening to the band rehearse in the living room of Laura Brophy and Kevin Johnsrude, who formed the Nettles in 1996, the listener is struck first, of course, by the music: compelling and fiery, lush and wild. But the next thing one notices is the way one’s body has begun to move, involuntarily and irrepressibly. This isn’t ethereal New Age mood music, wan and generically Irish in flavor, such as that produced by the likes of Celtic Woman or Enya. The Nettles pour a far more intoxicating brew, both mesmerizing and volatile. The band’s unerring talent to incite motion is the primary reason they draw the largest crowds at the Corvallis Folklore Society’s bi-weekly contra dances. “They will bring in the most people,” says Marfa Levine, who is in charge of booking bands for the dances, which draw 80 to 120 attendees. The contra dance, derived from centuries-old traditions in the British Isles and Europe, involves dance partners in a series of moves, performed with each other and other couples, similar to old-time square dancing. A caller instructs the dancers before and during the dance, until dancers are able to continue on their own, led only by the music. Guiding dancers with rhythm and melody is a skill at which the Nettles excel, according to Levine. The music is mutually inspiring for the musicians themselves, who, Johnsrude says, have a mission “to improvise using traditional music,” something many might expect to encounter more often in the realm of jazz. Citing global influences as far flung as Eastern Europe and as diverse as James Brown and Thelonious Monk, the group maintains that they “never play the same tune once,” a claim readily confirmed as they rehearse a medley of two tunes, “The Ships are Sailing” and “Indian Point.” Subtle changes are apparent as the group’s energy builds. Although devoted to improvisation, “We use the tune more” than the typical jazz band, Brophy explains. “We try to refer to the tune when we improvise a lot, make sure that it’s still there in character, partly because we play for dancers often and they may be listening for parts of the tune. In their contra dance incarnation, the Nettles consists of Brophy on fiddle and Johnsrude on guitar, with Michael Proctor on bass, Brian Bucolo on drums and Todd Silverstein, who also composes for the group, on pennywhistle, saxophone and bouzouki. At Big River Restaurant, a venue they play several times a year, Brophy and Johnsrude are joined by percussionist Ankush Vimawala on the Indian tabla. The Nettles also play at weddings, dance camps and festivals throughout the Northwest, and next fall will tour the East Coast from Washington, D.C., to Asheville, N.C. More information is available at www.TheNettles.com. What: The Nettles perform at the Corvallis Folklore Society contra dance, Saturday, May 20. 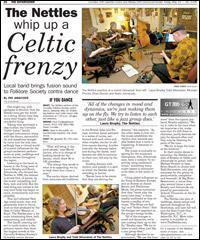 Rollicking rhythms and Celtic tunes, with instruction at 7:30 p.m.; all ages are welcome. Who: Open to the public, no membership required, only clean shoes. Cost: $6, general; $5, CFS members.